Is there a way to dye a white rayon dress different colors without having them bleed into each other too much? Message: I bought this white rayon dress that I thought might look really cool if it was all different colors. It also has small flowers that can be colored in, so I was just wondering if there is a way for me to dye it without having colors bleed into each other too much how would I do that? Would I add the sodium acetate to make the dye paint-like and apply it? Also would I have to add one color at a time, and wash it and everything before adding another color to avoid too much bleeding? Thank you! You can easily dye a washable rayon dress many different colors, without the colors bleeding together, if you use the right kind of dye. If you use a good tie-dye type of dye, which is called fiber reactive dye, you can apply many colors at once. The key is to avoid all-purpose dyes. Don’t use Rit dye! All-purpose dyes, such as Rit, always bleed together every time the garment gets wet, for the life of the garment. Better quality dyes avoid this problem altogether by bonding tightly to the fabric where you put it. What you need to do is get some good fiber reactive dye, such as Procion MX dye. 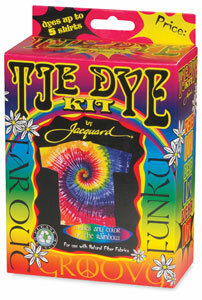 You can find these dyes in any good tie-dye kit, such as the Jacquard tie dye kits, which are often available at local crafts stores and fabric stores. Avoid hot water dyes. If you want a wide choice of dye colors, and access to more helpful products, order online from a dye supply house such as Dharma Trading Company, Colorado Wholesale Dyes, or PRO Chemical & Dye. Dharma is also a good source for additional dyeable rayon dresses. Once you have your good Procion dyes, mix a cup of sodium carbonate (soda ash or washing soda) with a gallon of water and soak your rayon dress in it. After fifteen minutes to let the sodium carbonate soak into the fibers, remove the dress from the mix and squeeze out extra water. You can apply dye directly to the wet dress, or you can line-dry the dress, which will leave the dry soda ash in the fibers, ready to react with the dye. DIssolve the dye in water, either following the directions on the package (for a tie-dye kit) or following instructions for how to tie dye (see “How to Tie Dye” and “Hand Dyeing – basic recipe for Procion MX dyes on cellulose or silk”). Put the dyes into the pointy-tipped squeeze bottles sold for use in tie-dyeing. Lay the dress out flat on a surface that won’t be damaged by the dyes (such as a plastic table protected by a plastic tablecloth with some old towels or paper towels on top), and dribble the different colors of dyes where you want them. If you only want bright colors, avoid placing opposite colors immediately adjacent to each other, such as purple next to yellow, red next to green, or blue next to orange, as these color combinations combine to make muddy browns.The wet dye on the dress should be darker in color than you want, because not all of the dye will attach; some will be washed away, which results in a lighter color than you see during dye application. After you have thoroughly covered your rayon dress with as many colors as you want, cover it with plastic and leave it alone in a warm place (70 degrees F or above) at least overnight, for the dyes to react with the rayon in the presence of the soda ash. Covering it with plastic is to help keep it moist, since the dye reaction stops once all moisture has dried up. It is better to leave the dress to react longer than necessary, rather than less time than necessary, because the extra time makes sure that all of the dye molecules have reacted, either with the fabric or with the water. The means there will no longer be any active dye present to cause staining with colors in the wrong places, when you wash out the excess dye. The next day, wash the dress once in cool water, to remove the soda ash and some of the dye, then wash two or three times in the hottest water available. To avoid unnecessarily abrading the rayon fiber, which is very weak when it is wet, you can soak the dress for a while in extremely hot water (even boiling water is okay for washing out Procion dyes), then wash out by hand and then repeat. If you prefer, you could dye the entire dress in multiple colors for the background, wash it afterwards, and then start all over again, line-drying the dress after soaking it in soda ash again, applying just the colors inside the flower patterns. This will reduce the amount the colors small patterns blend with the background color, and is a particularly good idea if the background color you apply contrasts strongly with the colors you apply inside the flower patterns. If the dye seems inclined to spread much more than you like, either apply less dye, or thicken this dye with sodium alginate. You can produce a really fantastic dress in a unique color pattern. Note that synthetic trim, such as the white stitching that holds the seams together, and any edging or lace, will almost always stay white, after washing out the excess dye, though sometimes a turquoise dye will stain it. This entry was posted in dye painting, dyeing bamboo and rayon, Procion MX dye, soda ash on June 7, 2015 by pburch.